Middle school Career Technical Education (CTE) has the power to expose students to college and career options and equip them with the transferable skills they need to plan for and succeed in high school and beyond. In recent years, a number of states have invested resources and supports to expand CTE and career exploration opportunities in middle schools, a trend that is likely to continue with the recent passage of the Strengthening Career Technical Education for the 21st Century Act (Perkins V), which now allows states to use Perkins funding to support CTE as early as the fifth grade. North Carolina’s Career and Technical Education Grade Expansion Program. The report concludes with major considerations for states when implementing or expanding middle school CTE, such as removing any restrictions that prevent states from accessing Perkins V funding and deciding whether middle school CTE is about career exploration, career preparation or both. Advanced Placement® (AP) and Career Technical Education (CTE) courses can and should work in tandem to support career readiness by encouraging the development of the academic knowledge and technical skills that are, together, increasingly important to students’ overall employability. For too long, “college-ready” and “career-ready” coursework and experiences have been viewed as separate in schools. With an estimated 65 percent of jobs in the economy requiring postsecondary education and training beyond high school by 2020, schools should promote college and career readiness. To help state, district and school leaders think through how to place students on pathways that prepare them for college and career, Advance CTE and the College Board partnered to examine how AP® courses can be integrated into CTE programs of study in Advanced Placement® and Career and Technical Education: Working Together. This guide examines how specific AP courses can be embedded into or used to augment programs of study by Career Cluster®. To help leaders with this work, this resource provides guiding questions for leaders to consider and examines how Maryland and Tennessee integrate AP courses into CTE programs of study. Throughout history, and continuing today, learners of color, low-income learners, female learners and learners with disabilities have been historically tracked into terminal vocational programs leading to jobs with uncertain promise of economic growth and prosperity. While the quality of CTE programs has significantly improved since then, many of these same learners cannot access high-quality CTE programs of study that prepare them for success in postsecondary education and their future careers. To help state leaders recognize these historical barriers and adopt promising solutions to close equity gaps in CTE, Advance CTE is launching a new series of policy briefs called Making Good on the Promise. 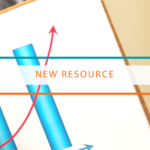 The first two briefs are now available in the Learning that Works Resource Center. 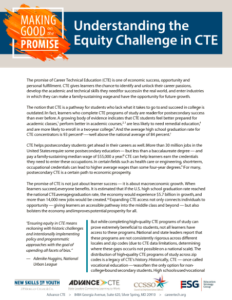 The first brief explores CTE’s history, taking a close look at the practice of tracking learners into low-quality vocational programs and examining the different ways that certain learners have faced barriers to accessing high-quality CTE programs of study. 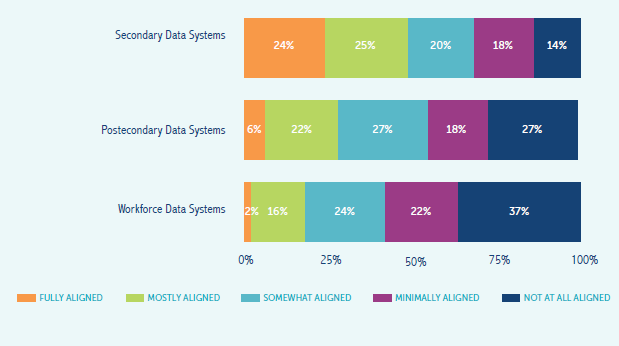 The second brief highlights promising practices from states that are using data to identify and address access and achievement gaps by different learner populations. Ultimately, each learner deserves to access a learning environment in which he or she is supported, feels welcome, and can acquire the knowledge, skills and abilities to achieve lifelong career success. But many of the structures and systems in place today enforce historical biases and discrimination that make it challenging for learners to access these opportunities. Reversing historical trends and expanding access and opportunity for each learner will require tough conversations, humility, and a commitment to both quality and equity. In Delaware, for example, state leaders made a commitment to use state CTE data to expand equitable access to high-quality CTE programs. Through the regular CTE performance management process, the Delaware Department of Education (DDOE) compares the population of learners in CTE programs to learners in the larger student body to identify enrollment gaps. If a certain learner population is either underrepresented or overrepresented in the program of study, it triggers a structured protocol. DDOE staff work in partnership with local leaders to conduct interviews with teachers, learners and parents and dig deeper into the root causes. DDOE and district staff debrief about the conversations and collectively develop a report summarizing the findings of the study. Although local sites are not required to act on DDOE’s recommendations, many recognize the need and seize the opportunity for additional state support. Conversations about equity are often difficult, but they are necessary to secure access and opportunity for each learner. Collaborative, data-driven strategies like Delaware’s CTE performance management protocol allow state leaders to identify and address inequities in an impactful way. In future briefs, we will explore how state leaders can work to rebuild trust among communities that have been historically under-served, expand opportunity for every learner, and put mechanisms in place to ensure learner success. 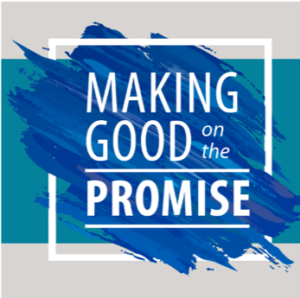 The Making Good on the Promise series is made possible through the New Skills for Youth initiative, a partnership of the Council of Chief State School Officers, Advance CTE and Education Strategy Group, generously funded by JPMorgan Chase & Co. These briefs and all future resources can be accessed in the Learning that Works Resource Center at careertech.org/resource/series/making-good-promise. What defines a high-quality career pathway? Is it alignment to labor market needs and career opportunities? The quality and qualifications of teachers and faculty? Access to meaningful, aligned work-based learning experiences? Perhaps all of the above? Defining the the components of high-quality career pathways is a critical priority of the 10 states participating in New Skills for Youth (NSFY), an initiative to transform career pathways and student success by expanding options for high school students. NSFY is a partnership of the Council of Chief State School Officers, Education Strategy Group and Advance CTE, generously funded by JP Morgan Chase & Co.
Today, Advance CTE released a series of snapshots highlighting promising practices and achievements of the 10 NSFY states, including the different approaches each state is taking to define and promote high-quality career pathways. Be supported by partnerships between at least one institution of higher education, a secondary district or school, and employer partners. In 2017, Massachusetts began accepting applications to designate HQCCPs, and plans to announce designated sites shortly. These sites will receive support, and in some cases, funding, from the state, and will work together as a community to strengthen meaningful career pathways that are aligned to the joint committee’s HQCCP criteria. 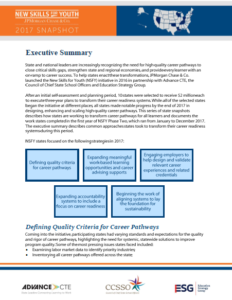 Other NSFY states chose different approaches to defining quality career pathways. Ohio designed a framework for local program administrators to evaluate program quality and make informed decisions about which programs to scale up and which to phase out. The framework is designed using four dimensions: learning environment and culture, business and community engagement, educator collaboration, and pathway design. Wisconsin took a regional approach through its Pathways Wisconsin pilot. Through the project, which has been rolled out in four regions across the state, regional Pathways Wisconsin directors are working with key stakeholders in their community to identify and recognize different career pathways within priority industry areas. Expanding meaningful work-based learning opportunities and career advising supports: Rhode Island engaged state business leaders to define and develop learning standards for work-based learning that could be implemented at the high school level. Oklahoma and Wisconsin are implementing new academic and career planning policies. Engaging employers to help design and validate relevant career experiences and related credentials: With the help of industry partners, Ohio developed a graduation endorsement called the OhioMeansJobs-Readiness Seal, which recognizes students who demonstrate employability skills upon graduation. In Louisiana, state leaders leveraged existing employer networks to establish education subcommittees on regional workforce development boards. 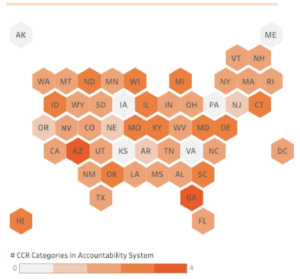 Expanding accountability systems to include a focus on career readiness: As states worked to develop and finalize their ESSA plans, accountability was a priority for NSFY states in 2017. Oklahoma adopted a postsecondary opportunities measure that looks at AP, IB and dual enrollment as well as industry certification and work-based learning. 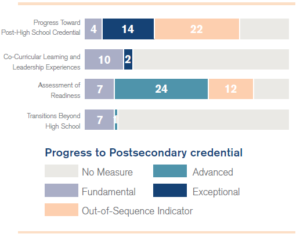 Separately, Kentucky is leveraging the Kentucky Center for Education and Workforce Statistics to identify and validate industry-recognized credentials, which will be valued in its accountability system. Beginning the work of aligning systems to lay the foundation for sustainability: Tennessee is working to integrate NSFY efforts into Governor Bill Haslam’s Drive to 55 initiative, a widely popular initiative to improve postsecondary access and success. Nevada codified the governor’s Office of Workforce Innovation into state law. Meanwhile, Delaware is working to strengthen Delaware Pathways, a statewide initiative to enhance and expand high-quality career pathways. To learn more about the pursuits of the NSFY cohort, read the 2017 NSFY Snapshot Executive Summary or download individual state snapshots.